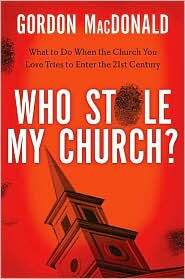 Gordon MacDonald, a prolific Christian author, columnist, and pastor from the United States, has written a book that tells the (fictitious) story of one such congregation in Who Stole My Church? What to Do When the Church You Love Tries to Enter the 21st Century (Thomas Nelson, 2007). As a pastor and conference speaker, he has faced that very question sufficiently often that he decided to write a book that would tell the story of a congregation going through such a crisis, of which he was the pastor. The tale is entirely fictional, but based on events that happen in real churches across the western world. The book reads relatively quickly because of its narrative style, but the principles he draws from the story are incredibly helpful. I bought and read the book because a good friend and mentor told me “Every Presbyterian in Canada should read this book.” As one of those, I took his advice, and am glad I did. For pastors, it helps us see what goes through members of the congregation who are beginning to feel alienated by the process of change and change itself. For laypeople, the book expresses what many feel, while also enabling ‘innovators’ and ‘early adopters’ to understand the thoughts and feelings of the ‘early majority’, the ‘late majority’ and the ‘laggards’ in the congregation. Those who adapt to change easily can be just as easily frustrated by those who do not – and vice-versa. One of the life lessons in this book has to do with the value of listening to each other. Another has to do with the importance of intergenerational dialogue. When the young and the old start to understand and appreciate each other, the process of change can become more tolerable. If the church is to thrive, change is inevitable. But it is never easy. However, MacDonald’s book helps the reader understand how and why change must happen in the church from biblical, historical and sociological perspectives. I found it a really helpful book. Buy it, and share it with key leaders in your church, as well with as those who resist change. It can only help the cause of Christ. I know this is fiction, but I cried in several places to think that this kind of understanding & changing of perspectives can happen. Our Session has read & used this book as a study together. I think that it has helped us know each other a bit better. We plan to bring this to groups within the church as more book studies. Maybe if we all read this, we’ll be able to understand where we’re coming from and where we may be going. WIth God’s great help, I pray. Thanks for the book recommendations! I just finished a bunch and am looking to grab a couple new ones to close out the summer.